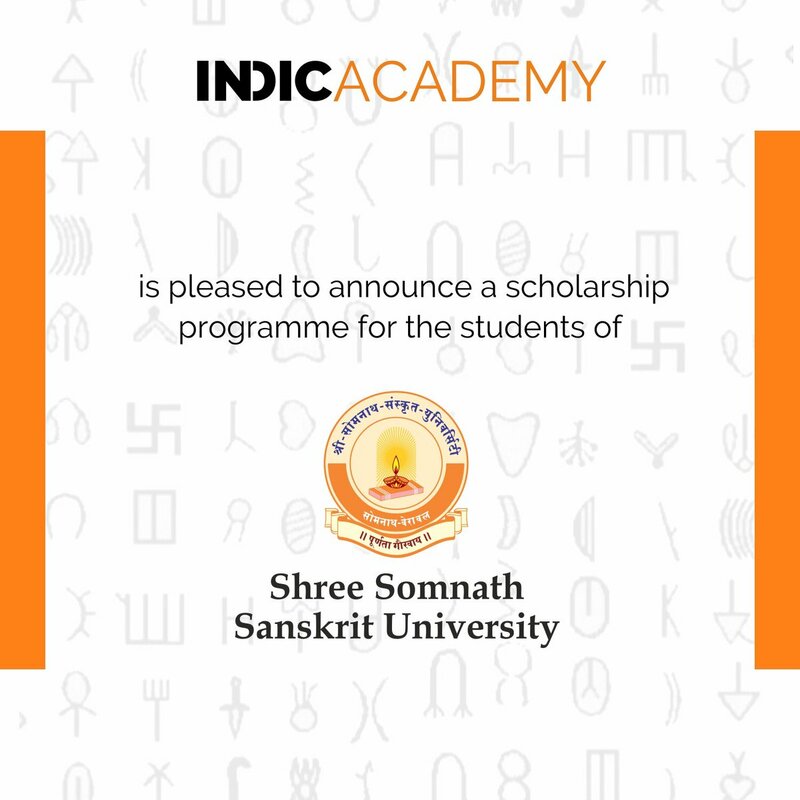 Indic Academy is pleased to announce scholarship support to research scholars & students at Shree Somnath Sanskrit University for courses, internships, workshops & seminars. Shree Somnath Sanskrit University (SSSU), Veraval was established by Government of Gujarat in 2005 by passing the Shree Somnath Sanskrit University Act. Shree Somnath Sanskrit University is a UGC recognized Public State University with Sanskrit as its medium of instruction. It has 7 faculties and 1 Constituent College and has given academic affiliation to 35 Colleges/Institutions across Gujarat, including University Sanskrit College and one B.Ed. College. The SSSU is a one of its kind University in Gujarat offering wide range of courses in Sāhitya, Jyotiṣa, Vāstuṡāstra, Veda, Vyākaraṇa, Navya Vyākaraṇa, Rāmānuja Vedānta, Swāminārāyaṇa Vedānta, Sarva Darṡana, Navya Nyāya, Dharmaṡāstra, Purāṇaṡāstra, Paurohityam and Yoga. In keeping with the Vedic tradition, Yajña is performed daily in the Yajñaṡālā of the University. The University Library called Ṡāradā Bhavana contains around 7,000 books. The University organizes National, State level Workshops, Seminars, Conferences and Training Programmes for teachers, and also organizes Youth Festival, Sarasvat Samaroh, Sport and Cultural activities for students. Students can choose from Certificate Course to Ph.D. in any of the offered subjects. Apart from Shastri (B.A. ), Shiksha Shastri (B.Ed.) and Acharya (M.A.) courses the University has set up its centers all across Gujarat to conduct various Diploma and Certificate courses on Temple Management, Paurohitya (Karmakanda), Jyotisha, Vastushastra, Yoga, Spoken Sanskrit and PGDCA. The University also runs two self financed research centers at Modasa and ARSH – Akshardham, Gandhinagar. Revival and propagation of Indian culture, propagation of Sanskrit language, and cultivation of moral values, strengthening our traditions and correlating them with modern wisdom are among the most important objectives of the University. In coming future SSSU intends to start M.Ed. Department, a College of Ayurveda and courses on Vāstuṡāstra and Architecture in collaboration with other Technical Institutions. Also comparative research on Vāstu and Engineering, Paurohityam and Chemistry, Jyotiṣa and Mathematics-Astronomy will be undertaken at the University in collaboration with Institutions in the field of respective modern sciences.